You and your guests could relish a unique and luxurious accommodation service. Enrich your special celebration with honeymoon suites packages or offer your guests the convenience to stay at selected hotels in Santorini. 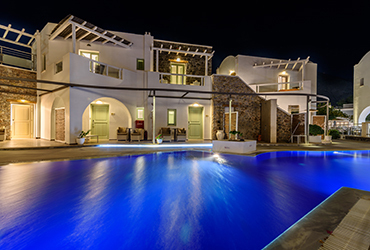 Combining modern art with traditional Cycladic architecture along with the facilities and services of a five star hotel makes it an ideal resort for your vacation in Santorini. 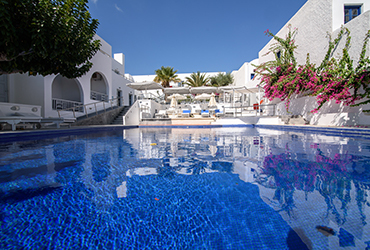 An exclusive 4* hotel built in traditional Cycladic architecture with all modern facilities. 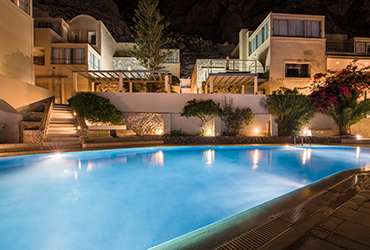 Situated in the shadow of Ancient Thira, at a peaceful location on the hillside, offering a magnificent panoramic view of Kamari and the Aegean sea. RK beach Hotel situated on the beach at the center of Kamari Village and with its luxurious chic aesthetic, traditional and unique Cycladic architecture, is ideal for convenient and enjoyable vacations.